There is a native North American legend that says that in the beginning of Earth’s history, there was a great conference with all the animals, to protest the devastating and ignorant attitude of mankind towards the environment. “Nature is the great mother of every animal, and man wishes to submit her to his fickleness”- accused the serpent, demanding that all the other animals take a stand . “The only way is to make them feel in their own skin the effects of their actions, even if it takes many generations” – pondered the coyote. And then it was decided that each animal would be transformed into a human disease: The lion would be heart disease, the elephant, obesity, the horse, skin afflctions. And the more man destroyed nature, the more he would be the victim of the revenge of the animal spirits, in the form of sickness. According to this tale, the vegetable kingdom then felt compassion for mankind and decided to help. And each plant transformed itself into a medicine, one for each disease created by the animal instincts. To the noblest plants, however, was given the mission of awakening consciousness, so that man could some day learn to live in harmony with the planet and fulfill his destiny. So it was that once, during a spiritual service, I asked the Daime: “What is the Daime?”- hoping that It would be able to explain to me Its nature and how It fits into our personal history. No one better than the Daime Itself to explain Its nature and significance. As an answer to my quest, I started noticing the different people who participated in the service, and the conceptions they had about what was happenning there. I found, then, five different definitions: Daime is a beverage; Daime is a religion; Daime is a doctrine, Daime is a Divine Being, and Daime is a Sacrament. The first two definitions (beverage and religion) came from visitors and the three last ones (Doctrine, Divine Being, Sacrament) came from ‘Fardados’ (1), that is, adepts who use the ceremony uniform. On another side, “Santo Daime is a religion” is the conception of a more spiritualized visitor, searching for the expansion of consciousness. Usually they are people who participate or had already participated of other spiritual services. Since the beginning of the century, in the cultural contact between Indians and rubber latex extractors, the Ayahuasca started to be used by northeastern migrants, who colonized western Amazon. From then on many groups emerged associating the beverage to a spiritualist-Christian religious context, of which the main representatives are the Union do Vegetal (UDV) in the Brazilian state of Rondonia, the Santo Daime and the Barquinha, in the state of Acre. Parallel to the cult increase, and the expansion of the use of Ayahuasca, there was a strong resistance from the part of conservative sectors of Brazilian society, which was pressing the government to seize the functioning of these institutions in bigger metropolitan centers. However, on June the 2nd of 1992, the council decided to definitively permit the tea’s utilization for religious purposes in the whole territory. According to the president of the Narcotics Federal Council then, Ester Kosovsky, “ the investigation developed since 1985 was based on a multi disciplinary approach, taking into consideration the anthropological, sociological, cultural and psychological, besides fito-chemical analysis” (3). The writer of the investigation process, Domingos Carneiro de Sá, explained that the fundamental fact for permitting the beverage was the behavior of Santo Daime adepts and the righteousness of the spiritual center which use the tea in its rituals: “There was no anti-social attitude, on the contrary, we could notice the integrating and restructuring effects of Daime among individuals who have social and psychological problems before coming to the ceremonies. (SILVA SÁ, 1996 145-174). 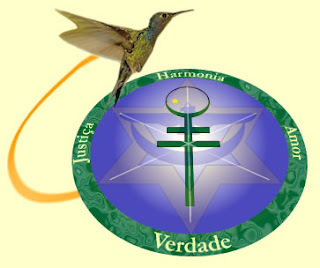 “Santo Daime is a doctrine” That’s exactly the conception that emphasizes this aspect of It as part of Acre´s popular culture, of Brazilian cultural (musical, poetical, spiritual) inheritance. The partisans of this conception give much importance to the ritual, to the liturgical calendar and the ethics teachings prescribed in the hymns, as well as the historical memory of the ritual founders (5). The hymns, chanted during night time are mediunically received and it is rehearsed priory to its presentation during the ritual. The basic ideas transmitted through the hymns are about sympathy and ecological conscience - poetic ballads intoned in simple and repetitive melodies, which work as ‘mantras’. Besides the chant there’s also a dance – called ‘ball’- that consists in move the body in the music compass, all together, to the left and to the right alternately, in a sort of static circular dance. This chain of voice and movement gets its ritihym from the Maracás, little can rattle. The participants get positioned in line forming a quadrilateral polygon, with ladies on once side, and gentleman in the other, around a table. In official parties, man use white tux with blue tie, and women white shirt, green jardinière with colorful ribbons and a silver crown. In the center, the Holy Cross (Caravaca´s Cross), and the Eastern Star (Solomon’s seal and an eagle by the last quarter moon). Besides Jesus Christ frequently is related to the Sun, the Virgin Mary is associated to the Moon, the Sea and the Forest, and the presences of Saint John the Baptist and Patriarch Saint Joseph are constantly remembered in Santo Daime songs. Other frequent image is the ‘Divine Eternal Father’, an affirmation of the monotheist principle of the doctrine, which commands over a “Celestial Court of Every Divine Beings”- that embodies, in the pantheist covering of the Queen of the Forest, an entity that goes from the Oriental Devas to African Orishas. However, the central entity of Santo Daime´s ritual is Juramidam, the “Master Empire”. According to the hymns and to the participants this is the being that is identified as the spirit of beverage taken during the ceremonies. The effect Santo Daime´s drink provokes a conscience expansion that, without being prejudicial to the capacity of voluntary action, allows one to observe its own feelings and thoughts clearer. As the cult occurs, the state of conscience intensified by the tea amplifies the repetitive situations of daily life, revealing existential contradictions and inner process that are repeated unconsciously in various levels. These involuntary processes are comprehended by the intensified conscience of the participant, through the chain created by the ball dance and the hymns that always suggest a positive solution to the problems. According to the adepts of the cult, the ritual is an “auto-analysis”. The process lived during the effect of the drink, opening the doors of the subconscient, and the conditioning movement of the ball, leads to a critic examination of our daily actions, base upon the Christian principles. The concept that believes that “Daime is a divine being” consider the power of the beverage independently from the ritual (and from the system of beliefs, although he too is a part of the system of beliefs) which credit to communicate directly with the plant’s spirit or to a superior intelligence. This conception has many versions and styles. To the most traditionalists, for example, this being is personified by the image of the creator of Daime, Raimundo Irineu Serra (6). He represents the return of the Christ to earth when one takes Daime (usually by a huge picture of ‘master’ Irene). Is with the spirit of Raimondi Irene Serra that each conscience dialogues. In other tendencies, as the one of Pariah Sebastian, there are also adepts for the idea that Daime is a divine being, but inside a broader and pantheist paradigm: “the master is in the sun, on moon, on the stars”. This conception of “master beverage” also appears in different kinds of shamanism and in other rituals and systems of beliefs, as the UDV. Is necessary to say that, while the process of legalization of the cult had the decisive participation of the ‘Doctrine’ sectarians, all the globalization process of the plant’s use (mixed with other spiritual cultures) is mainly due to the adepts of the ‘Divine Being’. And is it Daime a Sacrament? This way of thinking is more embracing and includes the four prior conceptions. The communication with divine is not set just through the hymns or with only one being, but throughout many intelligences, spirits, guides, archetypes, and, mainly, with the focus of attention directed to conscience deprogramming. One could say that the people that thinks Santo Daime ‘is a doctrine’, or ‘is a divine being’ represent the same emphasis from the ones who think Daime ‘is a beverage’ or ‘is a religion’, in a higher octave. The ones who thing It is a beverage ‘upgrade’ to the position to which It is a divine being; while the ones who think It is a religion start understanding it as a doctrine or Christian cult. The conception of It as being a Sacrament perceive the importance of both sides, as beverage and as system of beliefs, but focuses on conscience development. I have always thought about writing an article about Daime. I had even written a very descriptive one, but it always problem nothing. I wish to write a text to register the spiritual experience that changed my life radically. A subjective testimonial of an individual passionately involved with its object, but who aims to understand it in the most objective way possible. There are many obstacles for this for this ‘objectiveness’. First, one needs to comprehend that Santo Daime is an ‘interpretation’ of Ayahuasca. The same beverage is used in other systems of beliefs, in other rituals, such as in UDV and Peruvian Ayahuasca. And in order to have an objective vision of my experience with Santo Daime, I would have to have a less deficient knowledge of this other interpretations. There is also the DMT issue (or the chemical substance effect on the brain, the scientific system of beliefs) and how it relates to ritualistic uses of Ayahuasca (and the traditional and religious system of beliefs). In this sense, the researchers are also divided into three major groups: The ones who emphasize the drink and the DMT (biologists, chemists, among others); the ones who emphasize the system of beliefs (generally anthropologists and historians) and the ‘DMT devotees’ that, considering both aspects, elaborate a new system of beliefs. Let’s observe each one of these groups of researchers. The Pineal gland will produce a large amount of DMT on at least two moments of our lives: when being born and when dieing. Maybe it prepares the coming and the leaving of the soul. People who experimented the ‘near to death situations’ – seeing strong lights, portals, religious icons – report effects close to the experiences with DMT. The DMT molecules are similar to Serotonin and fit in the same brain receptors. That’s extraordinary because, as serotonin, the DMT is a specific key which naturally fits this brain ‘lock’. Thus, you have DMT suiting the brain receptors, which produces visions, while the pro-serotonin and pro-dopamine properties of the tea create a state of awareness and receptivity. On the scientific point of view, there are many hypotheses on the role of DMT in the brain. One of them is that this substance would be related to schizophrenia manifestation and other psychotic disturbs. However, similar levels of DMT have been found in schizophrenic and healthy people, making this hypothesis to be gradually abandoned. Another possibility, postulated in The Spirit’s Molecule, (Strassman, 2001), says that the DMT is produced by the pineal gland and it is related to apex experiences (to be born, to nearly die, and to die and so on). As it was said before, there are also researches which give greater emphasis to the context than to the psychoactive aspect. While the focus of the researchers from the biological area is framed particularly on the chemical effects of DMT in the brain, the researchers from the clinical and psychological areas study the changes in the conscience and perception states, distributing their attention in three factors: the beverage, the environment (setting) and the intention (set). The ‘set and setting’ hypothesis, first formulated by Timothy Leary with LSD in the 60´s, affirms that that the content of an experience with a psychoactive substance is a result of the interaction between these three basic factors. Charles S. Grob made the broadest bibliographical revisal on Ayahuasca within clinic psychiatry and neuron-psychiatry (METZNER, 2002, p 195) and considers hyper- suggestion ability as one of the psycho-chemical effects, detailing the environmental aspect (setting) in many factors (the leader role, the group, the place). He is one of the researchers who conclude that the “context, itinerary, and purpose” are more important than the chemical effects of psychoactive substances (in the processes of cure and self acquaintance provided by the beverage). In relation to the characteristics of the conscience states altered y the use of Ayahuasca, Grob points out: a) Expansion or reduction of reflexive conscience, with changes on thought, subjective changes in concentration, attention, memory and judgment cam be voluntarily inducted in various levels of the same experience. B)Increase in visual imagination. Grob also identifies, among the experience of thousands of interviewed user, many psychological repeated patterns during trance: Fear of losing control; resistance of the ego (bad trip) and transcendence to a mystic condition (surrender); increase in emotional expression – sadness, happiness, despair, faith; among other less frequent. Other great contribution to the psychological study of Ayahuasca is the work of Benny Shanon, The Contents of Ayahuasca Visions (2003), which, besides working on a list of images and visions and on the hypothesis of acceleration and deceleration of time perception during trance, discuss also mind research through Ayahuasca (and no longer effects of Ayahuasca over human mind). Shanon had already wrote about Ayahuasca as an instrument for mind investigation (in LABATE; 2002; pg 631), through cognitive psychology theoretical parameters. For him, there are first order phenomenological questions (what is being experimented?) and second order ones (is there an order and a reason for what is being experimented?). Towards the first order phenomenological issues, Shanon distinguishes the matters of content from the ones of domain and structure. Thus, felids, birds and reptiles are trance’s most common images, followed by palaces, thrones and heavenly architecture. The research detaches that the images are ‘mind universals’ (similar to Jung’s archetypes), once they appear in individuals culturally different. These contents may come up from different domains and the chain between these forms and these contents create narrative structures that are parallel to the rituals. And Shanon sees, through this cognitive system of contents/ domains, the structural parameters of conscience, and points out at least four relevant aspects son Ayahuasca effect: The perception of thought as a collective cognition, the undistinction between interior and exterior, the personal unidentification and the not linear time. From these four aspects the most interesting is the one which deals with our perception of time. When people take Ayahuasca, they realize that their thoughts are not individualized, but are ‘net-received’ (the mind as a radio); that they may become an animal (jaguars and eagles are common) or someone else; and finally they perceive time passing unevenly, some seconds taking forever and hours passing fast, and in some moments one can fell time simultaneousness (or the feeling of eternity). When we download files on a computer, we notice that some seconds are slower than others, due to the size of the file or the internet connection speed. What Shanon suspect is that the same thing happens to the mind, but it only can be noticed when on the effect of Ayahuasca. The vast majority of researches are subdivided in the ones who emphasize the ritual, and the ones who emphasize the cognitive effect of the beverage. But besides the psychological, anthropological, biological and juridical researches, there are also many of them about the music, the poetry, the dances of the ritual, anyway, all the semi-optical description of the cult. There are also researches who advocate a perspective similar to the adepts that understand Daime as a Sacrament, that comprehend the conception that emphasizes the environment as much as the one emphasizing Ayahuasca and the DMT (8). The McKenna brothers, will turn the cognitive feature of drugs and the psychedelic experience of counterculture will become an ‘ethno-pharmacology’, which is, a systematic study of enteogenenic use traditions. Terence McKenna (1993, 1994, 1995, and 1996) establishes a strategic association between two different hypotheses then, which became canon for the enteogen movement: First, the hypothesis that was taking psychoactive substances that the monkeys became aware of themselves, starting human evolution. This hypothesis suggests that all our experience with sacredness was originated from chemical consumption. Then, the hypothesis of Gaia (James Lovelock and Lynn Margulis) according to which Earth’s biosphere would actually be a living organism. In a way that, more than devices for social control (drugs), the psychoactive substances would function primarily as a re-connection of man with the planets telluric conscience. Anyway, what really draws attention to the ideas of the McKenna Brothers is the compression of the enteogenic plants in a context of a ‘great symbiosis’. In this perspective, the symbiosis between plants and animals in the earth’s biosphere is not limited to the exchange of oxygen to carbon dioxide, or mutual production of food or protection, but, above all, to a higher project, in which the enteogenic plants play the key role modifying the human behavior towards the environment. In other words: we are being colonized and doctrined by the vegetable world to change the habits of plundering animals to better interact with the plants organic life. For us, this symbiosis (between man and the organic world) really exists, but it is not that big, if we consider the possibility of a symbiosis between man and the inorganic kingdom, in which there would be an exchange of organic vital energy for inorganic temporal conscience, as Castaneda suggests. In this case, the Ayahuasca, besides being a vehicle for a message from the vegetable kingdom – to some DMT would be a chemical message to our brain - in order to reverse self-destruction process of man and organic life, would also be a way to accomplish a symbiosis with the mineral kingdom. Jeremy Nearby, for example, in his book The cosmic snake, compares DNA´s double helix structure to the two serpents of the Caduceus symbol and advocates the thesis that DMT is a key to human evolution (the logical ‘program’ from the vegetable world to be processed by human brain) from the point of view of the molecular biology. As it is known, the oral psycho activity of DMT depends on the inhibition of the MAO enzymes; and neither the leaf nor the vine is psychoactive f taken separately. Then, how did the natives found out the ‘Ayahuasca effect’? How have they figured out, among thousands of plants, without any technical instrument or scientific knowledge, that two of them had an effect able to provoke a trance, without noxious side-effects? For some people, it was the plants themselves that taught them. This is the point that orients the trans disciplinary research (METZER, 2002, 264) in which the experience that emerges from spirituality overflows the limits of every religious tradition: Ayahuasca gives us health, knowledge, spiritual power? And what about us? What are we giving it back? Love and Joy? Personal improvement, money or work to responsible institutions? Or do you not consider yourself in debt with the plant, or the people or the institutions? There is an evident change in attitude on people that have taken Ayahuasca. Only 10% considered it meaningless to their lives. From the 90% that considerer it to be relevant, half never comes back or participate sporadically of the ceremonies. The institutions estimate that about 30% (9) of the people who get to know Santo Daime adopt it as their spiritual path and get ‘regimented’. As the years pass by, besides a big rate of discontinuance, the participation of the ceremony becomes trivial and the transformation impact of the start loses its power, taking the adept to new levels of effort to keep up with their progress, or leading to a conformist adaptation towards religious institutions and society in general. Among the tendencies that follow Padrinho Sebastião, there was a period in which communitarian life in the Amazon was stimulated as a way to keep up with the deprogramming of social life, but, nowadays, all the institutions that work with Santo Daime emphasize social integration among its members. In my personal experience, I noticed that the first two years in the doctrine are about trans personal experience (visions as the one described and classified by Shanon). Invariably these are years of profound transformations. Next, the adept goes through a period of re-educational experiences form the inter-personal point of view (‘passages’ that involve the projection of their parents on church hierarchy members, the conflicts and friendships with other followers, platonic and real love affairs for learning their preferences and affinities). I believe that this period could indefinitely go on. And, after ten years, in case one had made an effort on he previous stage, a period of personal development, in which the tone is the subjective ethical improvement, for which conquers are gradual and got to be very consolidated. The key to continuous progress, and to the overcoming of its different levels, could either be in the question formulated by Metzner (what do we give back to the power plants?) as well as in the idea enclosed in the word Daime (11). The retribution to Divine Generosity with human generosity in a huge feeling of gratefulness. “Once it was all given to me, I will give all of myself too” – this idea is what makes the Sacrament meaning surpass, It is no longer the plant, or the beverage, or the doctrine which is sacred, but “I am” (one in communion with divinity”). For more information on the subject, access CEFLURIS official website < www.santodaime.org >; or the e-magazine A ARCA DA UNIÃO www.arcadauniao.org , and < www.neip.info >. Of course these are absolutely subjective parameters (even them being based upon observations other than mine), from someone who believes to maintain progressing within the Daime doctrine for over 20 years. The researches with long-term users (developed by Hoasca project, from UDV, among others) limit themselves to the study of the fact that does not occur any physical damage or the social integration appeased by the beverage. Up to this day no one had studied smaller variables such as changes in alimentation, progressive inhibition of the sexual behavior, and less than all, of course, subjective variables related to the ethical and spiritual progress. This is a Portuguese conjugation for the verb To give. ANDRADE E.N., BRITO G.S., ANDRADE E.O., NEVES E.S., McKENNA D., CAVALCANTE J.W., OKIMURA L., GROB C., CALLAWAY J.C., et al. - "Farmacologia humana da hoasca: estudos clínicos (avaliação clínica comparativa entre usuários do chá hoasca por longo prazo e controles; avaliação fisiológica dos efeitos agudos pós-ingestão do hoasca)" , in: LABATE B., SENA ARAÚJO W., O uso ritual da ayahuasca, 2002, p. 621-630. BARBIER, Regis. Ayahuasca como opção espiritual 2002. LABATE Beatriz Caiuby A Reinvenção do Uso da Ayahuasca nos Centros Urbanos. Campinas, Mercado de Letras/Fapesp, 2004. MEYER, Matthew D. Religious Freedom and United States Drug Laws: Notes on the UDV-USA Legal Case. Publicado pelo Núcleo de Estudos Interdisciplinar sobre Psicoativos – NEIP, 2005. MCKENNA, Dennis J.; CALLAWAY, J. C.; GROB, Charles S. The Scientific Investigation of Ayahuasca: A Review of Past and Current Research. The Heffter Review of Psychedelic Research, Volume 1, 1998. MCKENNA, T. - Alucinações Reais Rio de Janeiro: Record/Nova Era, 1993. _______ Alimento dos Deuses Rio de Janeiro: Record/Nova Era, 1995. ________ Retorno à cultura arcaica Rio de Janeiro: Record/Nova Era, 1996. ________ (com Ralph Abraham e Rupert Sheldrake) Caos, Criatividade e o retorno do Sagrado - trialogos nas fronteiras do Ocidente São Paulo: Cultrix/Pensamento, 1994. METZNER, Ralph. Ayahuasca - Human Consciousness and the Spirit of Nature. Thunder's Mouth Press, New York, 1999. Tradução Márcia Frazão, Rio de Janeiro: Gryphus, 2002. SHANON, Benny. - Ayahuasca visions - a comparative cognitive investigation, Yearbook for Ethnomedicine and the Study of Consciousness, 7, 1998, 227-250. _______ A ayahuasca e o estudo da mente in: LABATE B. & SENA ARAÚJO W., O uso ritual da ayahuasca, 2002a, pp. 631-659. ________ O Conteúdo das visões da Ayahuasca. Revista Mana, Out 2003, vol.9, no.2, p.1, 09-152. < http://www.scielo.br/scielo.php?script=sci_arttext&pid=S0104-93132003000200004&lng=pt&nrm=iso >. STRASSMAN, Richard. DMT: the spirit molecule: a doctor's revolutionary research into the biology. Rochester: Park Street Press, InnerTraditions, 2001.